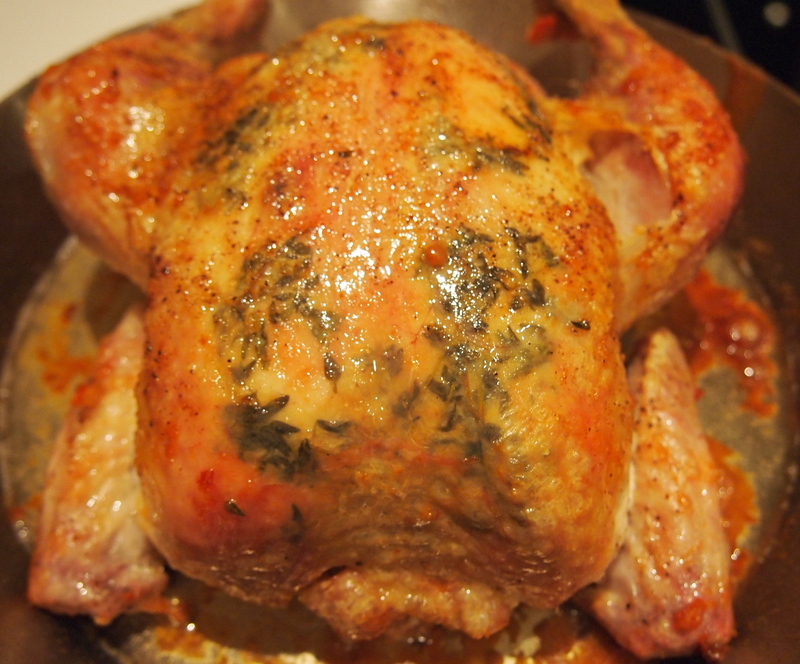 A while ago I published a post titled Thomas Keller’s Perfect Roast Chicken. 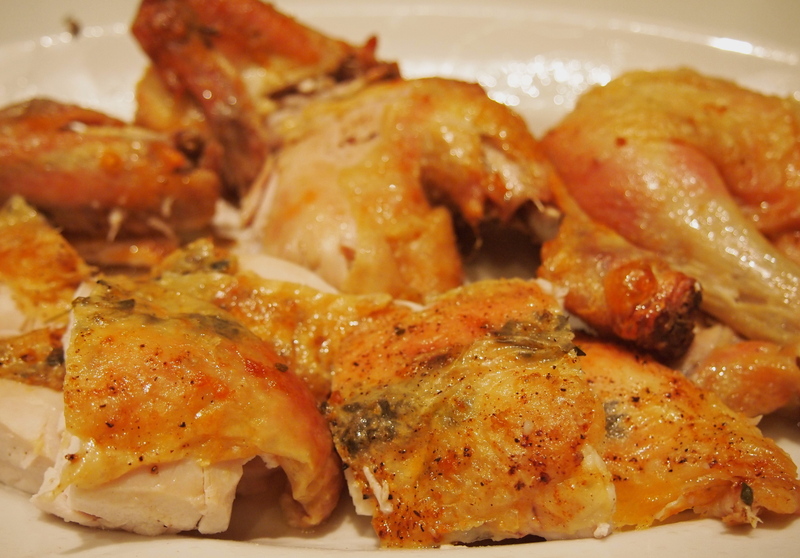 I love it for it’s ease and simplicity and it’s been my go to roast chicken recipe ever since. But I decided I needed to do some further testing to see how Thomas Keller’s roast stood up to other hot contenders for this title. One of the most popular and much blogged about roast chicken recipes is from iconic American chef Judy Rodgers from the Zuni Cafe in San Francisco. I’ve been wanting to try this roast chicken recipe for a while but the almost four page long instructions in her Cafe Zuni cook book put me off. On further examination it turned out that most of the instructions related to the accompanying bread salad. It was a cold evening and I was going to serve my roast chicken with bread sauce so the recipe was quickly whittled down to a very manageable few paragraphs. The basis of the roast is very similar to Chef Keller’s in that no fat is added to the chicken, the chicken is roasted at a very high temperature and the bird is in the oven for roughly the same amount of time (50 minutes or so). The major differences are the pre salting of the bird for a good 24 hours prior to roasting, not trussing the chicken and turning the chicken a couple of times whilst it’s in the oven. The pre-salting is done to enhance the moistness of the flesh – a little like a dry brine of sorts and it’s this step that really elevates this chicken. With the high roasting temperature in both recipes it can be easy for the bird to be just a little on the dry side but the pre-salting ensures moist flesh without compromising the crispy skin. The Zuni Cafe chicken is also stuffed with a few tender herbs between the breast and skin which not only looks great but adds wonderful flavour. So this roast is a little more labour intensive and if you’re strict about the salting times, not something you can whip up at a whim but the flavour produced is absolutely worth it and in my opinion results in much more succulent flesh than Thomas Keller’s version. So I now have two fabulous roast chicken recipes – one for when I decide I want a roast chicken quick smart and one for when I’m a little more organised, which ever you decide to cook you won’t be disappointed! 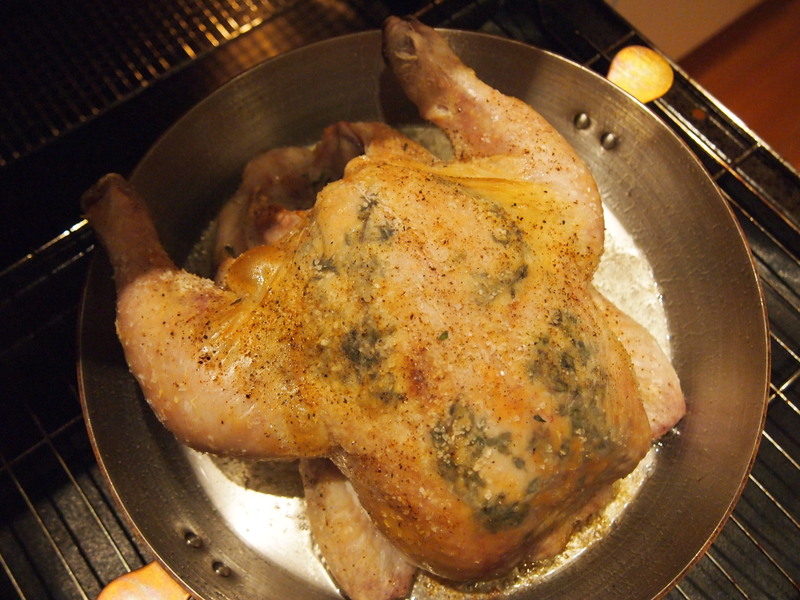 Seasoning the bird – you need to do this at least 24 hours prior but 2 days would be even better. Remove and discard the lump of fat inside the chicken. Rinse the chicken and pat very dry inside and out. Be thorough — a wet chicken will spend too much time steaming before it begins to turn golden brown. Approaching from the edge of the cavity, slide a finger under the skin of each of the breasts, making 2 little pockets. Now use the tip of your finger to gently loosen a pocket of skin on the outside of the thickest section of each thigh. Using your finger, shove a herb sprig into each of the 4 pockets. Season the chicken liberally all over with salt and pepper (you need to use a good ¾ of a teaspoon of salt per 500g of chicken). Season the thick sections a little more heavily than the skinny ankles and wings. Sprinkle a little of the salt just inside the cavity, on the backbone, but don’t otherwise worry about seasoning the inside. Twist and tuck the wing tips behind the shoulders. Cover loosely and refrigerate. Roasting the chicken. 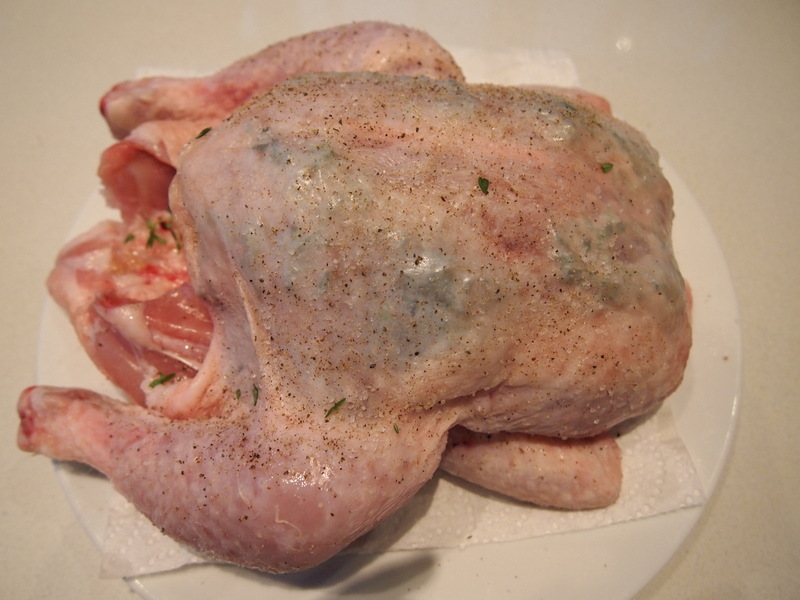 Take the chicken out of the fridge and and leave it uncovered for a good hour before you’re ready to roast it so the chicken can come to room temperature. Preheat the oven to 230C – it’s a good idea to invest in an oven thermometer to make sure your oven is actually heated to 230C.. Choose a shallow flameproof roasting pan or dish barely larger than the chicken, or use a 10-inch skillet with an all-metal handle. Preheat the pan in the warming oven until it gets nice and hot. Wipe the chicken dry (really dry) and set it breast side up in the pan. It should sizzle. Place the pan in the center of the oven and listen and watch for it to start browning within 20 minutes. If it doesn’t, raise the temperature progressively until it does. The skin should blister, but if the chicken begins to char, or the fat is smoking, reduce temperature by 25 degrees. 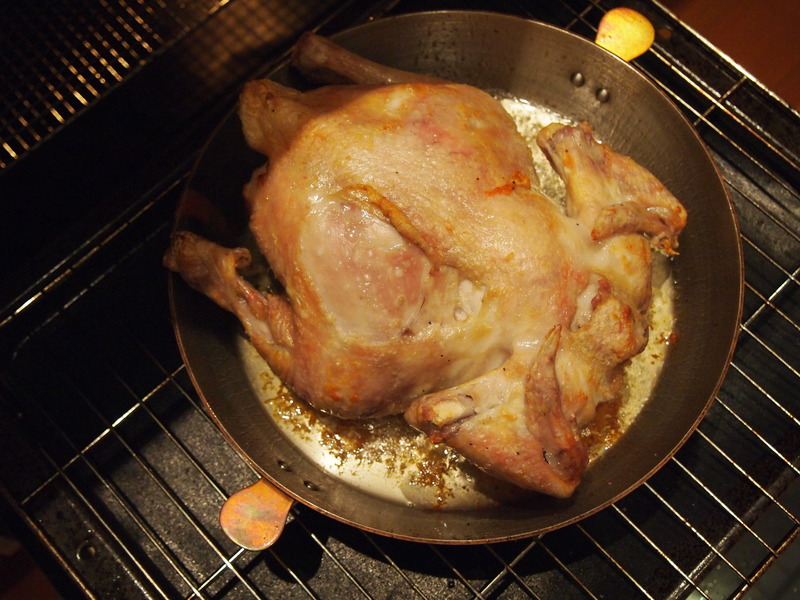 After about 25-30 minutes, turn the bird over — drying the bird and preheating the pan should keep the skin from sticking. Roast for another 10-15 minutes, depending on size, then flip back over to recrisp the breast skin, another 10-15 minutes. The chicken will be in the oven between 45 minutes to one hour, depending on the size. For my 1.8kg chicken I roasted it breast side up for 25 minutes then turned it over and roasted it for 15 minutes and then a final 15 minutes on the breast side again, all at 230C in a fan forced oven. Remove the chicken from the oven and turn off the heat. Lift the chicken from the roasting pan and set on a plate. Carefully pour the clear fat from the roasting pan, leaving the lean drippings behind. Add about a tablespoon of water to the hot pan and swirl it. Slash the stretched skin between the thighs and breasts of the chicken, then tilt the bird and plate over the roasting pan to drain the juice into the drippings. Leave the chicken to rest in a warm place; the meat will become more tender and uniformly succulent as it cools. Cut the chicken into pieces and serve with the pan drippings poured over.